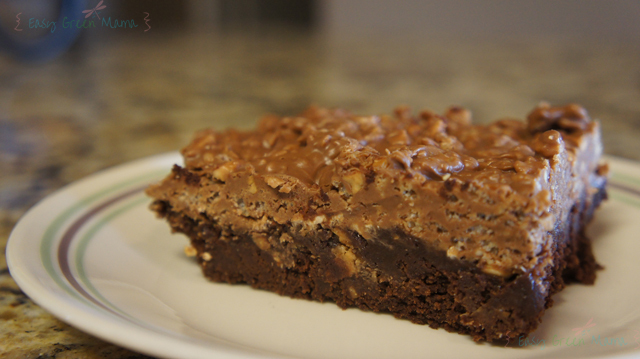 I went extreme with this brownie creation this week and boy was it good! Now this is a delicious brownie but it is rich so I suggest eating it with a cup of milk or some vanilla ice cream! My parents had visited and tested it and loved it, and my boys loved it too! Everyone really enjoyed the crisp chocolate & peanut butter topping. I used all Gluten Free ingredients but this recipe will work with non Gluten Free ingredients too. I also used a brownie mix and used the ingredients the box called for. When you make this for yourself make the brownie mix according to your brownie box directions and then add my extreme ingredients! Very Rich and Tasty Brownies with a delicious crispy chocolate topping! Combine brownie ingredients in a large bowl and mix well. Heat Peanut butter in microwave safe bowl for 10-15 seconds in microwave. Spoon onto top of brownies. Heat marshmallow fluff for 10-15 seconds in microwave. Use butter knife to swirl peanut butter and marshmallow fluff into brownie batter. In microwave safe bowl combine ingredients. Microwave for 1 - 2 minutes. Stop and Stir every 10-15 seconds. Spoon on top of baked brownies and spread out evenly. Place in refrigerator for 90 minutes or overnight.